1. Lim Hock Swee Trading Co.
An unamused shopkeeper pointed an accusing finger at us, and then at our camera phones which we so confidently whipped out to capture what laid before us. Now hot behind the ears, we kept our phones out of sight before revelling in the festive trappings and trinkets the quaint little store is brimming with. And we really mean it when we say brimming. Via a extremely narrow pathway, we navigated through the store which was also fleeting in its journey. In an estimated 20 steps, you’ll most likely find yourself at the tail-end of the store, surrounded by faux Christmas trees that are trimmed to the nines. Aside from the razzle dazzle of Christmas ornaments and trimmings, the Geylang store also offers certain peculiars such as life-sized Santa Claus and snowman inflatables. When Christmas ends, a salesperson shared that the space will make way for the Lunar New Year decorations, before turning back to liquor and hamper store when that season comes to a close. 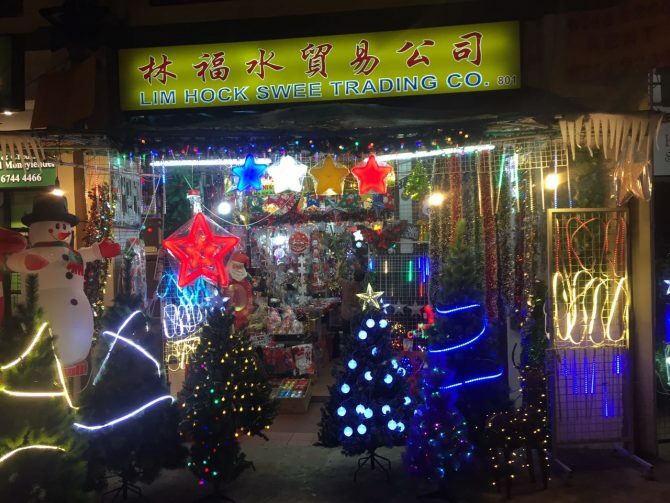 P.S: If the store doesn’t serve your festive needs, a separate shop located right opposite Lim Hock Swee is also serving a whole buffet of Yuletide goodies. On the non-festive months, the shop resumes selling all kinds of government-approved electric bikes.